No-one can pinpoint exactly, to the hour, when the Queen came to the Hampshire house. But she did. They’ve had a handwriting expert in to examine her letter and everything. It’s just that her schedules do not show when this serendipitous visit occurred. It happened at the last minute, it seems. It was such a delightful and unexpected pleasure to pay you a visit last week, and I greatly enjoyed seeing the lovely garden, and your beautiful house so full of treasures. One does not often see a garden so well placed, with sudden exquisite views to thrill one, and my own garden looked a positive jungle after your green walks and splendid clumps of shrubs and roses! I’ve never seen a real letter from the real queen before. I’ve seen acknowledgements from her lady in waiting, but nothing as warm and frank and beautifully written as this. But perhaps I do not move in the right circles. Ralph Stawell Dutton, however, moved in exactly the right circles. The eighth, and last, Baron Sherborne had consummate taste. He took an old house and garden – Hinton Ampner in Alresford- and made it a little piece of perfection: built in 1790, remodelled in 1867, Dutton took the shell and created what he saw as the spirit of grace and beauty: a Georgian country house. In 1960 a fire raveaged one end of the house and his extensive library. But it did not defeat the Baron; he simply called in the best architects money could buy and remodeled in true Georgian style all over again, buying old books to fill the house. Filled with things Georgian, it was nevertheless a house which boasted all the modern conveniences: state-of the art bathrooms, telephones in all the right places, heating and plush, deep carpets. A house fit for a queen indeed. My friend Lydia and I had come ghost hunting. The last house, the Tudor one, had been knocked down after horrific tales of murdered babies and monstrous hauntings, servants who would not stay put, dark spectres and disembodied voices. And yet as we ambled over the site of the old place we could feel nothing but harmony. For it was such a very beautiful garden. It was theatrical.Everywhere you looked there was a frame, a vista, symmetry. He never married. He lived there, partied there, grew old there and died falling down its elegant stairs, before life could become cumbersome. And he created a house which could delight a queen. The man had enduring style. 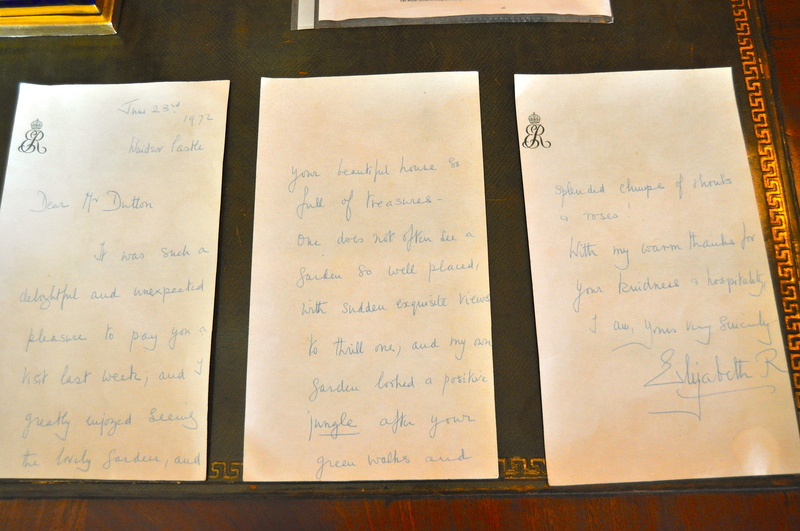 Posted in Places to visitTagged Elizabeth R, Hinton Ampner, history, letter from the queen, National Trust, Ralph Dutton, the queenBookmark the permalink. what a lovely place, thank you for shring. I love your rather unique photos such as the sheep and tree one. taking the moment and making it forever! My camera is my memory, Sidey, as I never clock anything first time round. So I go home and look at the pictures I took, and I say to mesylf, did that really happen? Wonderful. Memories and are they all properly labelled? Of course not. They are all a jumble, like my mind. Me too. I want his bathroom. If ghosts there be, they are comfortably situated. Who could fault them for choosing such a home? I know just what you mean. Such sartorial taste for ones so insubstantial. Hey Kate – another gorgeous house for us to roam around with you, courtesy of your ghost hunt! You’re right, the garden is spectacular, especially in spring, with the wisteria, and the meadow garden dotted with flowers, but what I loved most of all was the bathroom – with the books piled up on his ‘black boy’ stand – doesn’t that say it all! HM has good taste in gardens, it seems. By the way, isn’t it interesting that she called him “Mr. Dutton” and not “Lord Sherborne”. I was also struck by the means of address. Much I don’t know about the etiquette of these things, it would seem. Course, my favourite is The Blackadder Queenie, who calls him ‘Edmund’ and Cardinal Melchett ‘Melchie’. This really interests me. I’ve just finished illustrating a family history that my sister has written. We found a link to the “Stawell” family in Devon around 1674. I shall have to forward the post to her for her to research some more. Well then, this may interest you: here is Lady Stawell: http://www.flickr.com/photos/kateshrewsday/8816852868/ and here again: http://www.bbc.co.uk/arts/yourpaintings/paintings/elizabeth-hext-d-1657-lady-stawell-216981. And you’ve probably seen this. Interesting there’s a Stawell buried a stone’s throw from me here. Love the slide show today and you’re right about Elizabeth’s lovely hand. Your Queen is a charmer. As for the house, I might decide to haunt it myself. It seems a lovely place to potter about. Well worth a visit, Cameron. Their ploughman’s lunch is to-die-for. I’ll join you, Nancy. Perhaps we could all drift off there one day for a spectral blogmeet. Gorgeous pictures! Looks very lovely to visit and hunt for ghosts. Do you know, I think we all but forgot about the ghosts 🙂 Such a comfortable place to be. Ooooh. Let that be a warning to us! Lovely garden, indeed. I recall I was invited to try out the piano in that home, once. They had a lovely relaxed attitude towards visitors. What a gorgeous, gracious garden! It is manicured and precise while also giving a homey impression. I took two jaunts to the Long Beach moored Queen Mary to view documents, artifacts and a huge amount of memorabilia from the Royal family. My understanding is that the Queen authorized and even sent items on loan raising money for breast cancer research tied to one of Diana’s charitable concerns. There were many personal letters on display, some from the Queen to “very ordinary people” as she thanked them for a small kindness. I was SO impressed. I’ve already used the word “gracious” to describe the garden, but I also feel that the Queen is a very gracious woman, and it comes through in her personal notes. Debra, I would love to see that correspondence. As you say: the Queen has a special kind of grace. How wonderful! A lovely, lovely estate with such an air of warmth and welcome. No one the Queen sent such a thoughtful note. Your photos take me right into Hampshire House, Kate, and oh those gardens. What an elegant house, Kate. I’m sure I could get very comfortable in such a place. The tulips are beautiful, and I love the Queen’s letter. Lovely garden, home and vistas. I especially love that long walk amidst flowers, and of the lamb. Kate, the Queen was gracious. I’m sure her garden was every bit as beautiful as Ralph Stawell Dutton’s. Sounds as though you and I attended the same school of photography. At times, I quickly take a photo and then become determined to have all the settings perfect. All too often, that first one is the best! So the Queen only visited…she didn’t stay overnight, I gather. Impressed by the ‘normal’ prose of that letter! Don’t know why I expected a royal missive to be well, more grandiose! I love the bookstand in the toilet! And the garden is indeed gorgeous. Shall have to find my way there sometime Kate. Thank you for showing us around. Looks like a mighty fine place to go ghost hunting, that’s for sure. But poor Mr. Dutton met a rather sad end, falling down the stairs. At least he had a good life in a beautiful place. It was facinating to hear of your visit to Hinton Ampner. I too share your delight in the house and gardens and in fact have been a room guide there for some years. With regard to the letter from the “Queen”, the letter was in fact from the Queen Mother and this was confirmed by the staff at Windsor Castle. Hi, I live in Ajax Ont. CANADA. I have recently come into possession of a very old sterling lighter which reads; Mary from Joan and Charles on one side and Sherborne 1953-1954 on the reverse. Can you help! In response to why ‘Mr. Dutton’ and not ‘Lord Sherborne’, he didn’t inherit the title until 1982 (from a cousin) and in 1972, when the Queen’s letter is written, he was just Mr. DUtton. Thank you for that, Jay!